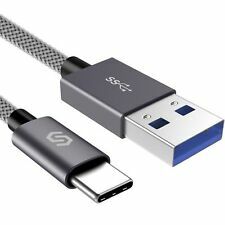 Premium USB-C cables are Incredibly Durable Tangle-free nylon cord with aluminium casing has a 4000 bend lifespan. NYLON BRAIDED CABLE WITH ALUMINIUM ALLOY HOUSING. Devices are becoming more and more powerful and the capacity of batteries and application sizes are becoming larger and larger. Using fast wireless charging technologies. Electromagnetic field for Qi wireless charging.